When my mum was still a diplomat posted overseas, she used to send me a wish list from everybody in the embassy that was as long as my arm and took up half of my baggage allowance. I never understood this. Fanta Grape? Honestly? You want me to bring a sixpack of Fanta Grape? A BIG bottle of Mrs. Balls chutney? Are you sure the Hungarians don't have chutney? etc. etc. Since graduating and living in 3 different countries, now in Australia, I understand. When you're not in your own country you really miss the little things. Big things as well, like friends and family, and mountains and jacaranda trees, but mostly the little things. Like Fanta Grape. And Mrs. Balls chutney. 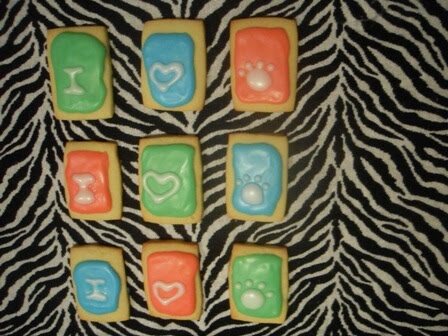 And Zoo cookies. 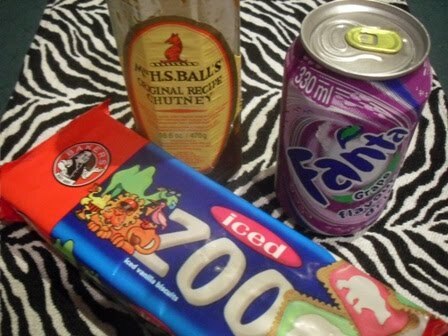 I can't remember Zoo cookies ever being my favourite while growing up, but it was defenitely part of my cookie eating repertoire (Romany Creams - a chocolate sandwich biscuit - was my favourite). There was a special way to eat them: First you nibble the exposed cookie around the icing. Then you lick off the iced animal. After this it was up to your own discretion. Either you could lick the coloured icing off the leftover biscuit, followed by the biscuit itself, or you could finish off the whole cookie in a couple of bites. Thinking back about this, eating them this meticulously must have stopped us from scoffing the whole box in one sitting, which is what I did with Romany Creams on a regular basis. Luckily for me, there's a whole bunch of South Africans living in 'stralia, which also means you can get hold of some of your favourites fairly easily. Like Fanta Grape, Mrs. Balls and Zoo cookies. I haven't come across Romany Creams yet, but I'm sure I will if I look for them. I found the Zoo cookies in our local Maxi's the other day, and it's now a regular item in my shopping basket. I've even been known to share them occasionally, which I usually don't do with my South African hoard. The feel good memories I get from eating them is almost as good as a trip home. Except, and I know this is going to make me sound really old, they're not like I remember them. They seem a lot harder, and the iced animal on top is too thick to lick off without cutting your tongue to shreads. Which of course made me think that I must try and make them myself. And then Meeta came along and announced that the theme for this Monthly Mingle is South Africa, and I was sold. Zoo cookies it is. For the biscuit I used the butter cookie recipe from my favourite favourite How to be a Domestic Goddess. I love this recipe. It's easy to make, it tastes good and it freezes well. It might be plain, but I think in the same way people call vanilla "plain". Not plain at all, just understated perfection. 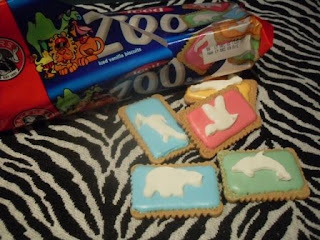 As you can see my biscuits don't have the animals on them like the original Zoo cookies. I wanted to put my own stamp on it. Also, I didn't trust my icing skills to reproduce recognisable animals. Let's be honest, I barely pulled off little paw prints. Maybe one day when I'm all grown up. Cream the butter and sugar together until pale, then beat in the eggs and the vanilla. In another bowl, combine the flour, baking powder and salt. Add the dry ingredients to the butter mixture, and mix until combined. Let the dough rest in the fridge for at least an hour. Sprinkle a suitable surface with flour, and roll out one half of the dough to a thickness of about 1/2 cm (keep the other half in the fridge for now). Cut into rectangles, or any shape you wish, and place them on a baking plate. Bake for 8-12 minutes until lightly brown. Cool on a rack and continue with the rest of the dough. Add the icing sugar to about 2 tablespoons of boiling water. Add more water to form the consistency you want. Divide the icing into different batches and colour, remember to leave one batch white. Add a colour layer to your cookies, and let harden completely. Draw some little animals of whatever your heart desires on top with the white icing. Let harden again before serving. 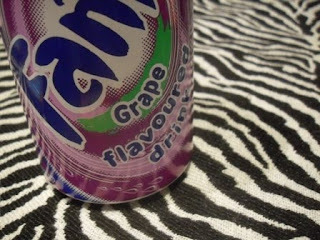 Enjoy with some Fanta Grape.